CERTAINLY the finest tourist spot in India. Well ! The best things in life they say are for free! We believe that the best certainly need not to be the most expensive. From an altitude of nearly 3000 meter from the sea level, with a vertical drop of 529 meter, the snowy slopes of Auli can bring the best in you. For, sliding down the beaten snow on skis at a speed of 20-40 km per hour can be a thrilling or harrowing experience, as the case may be. While coming down, perched on two precarious all your attention is nailed on the view in front of you, the way it is during a video game. Only, the thrill this time is not vicarious; a single error of judgment can cost you a precious limb. This may be hard to digest for the buffs of Hindi movies, where seemingly all one needs to do for skiing is to slip into the ski boots, tilt one's body a little forward, and keep pushing yourself with a pair of clubs. But reality can bite worse than frost! It requires hours of disciplined training, months of practice, and years of experience before one can actually enact the valiant hero on a ski, chasing the light-of-his-life on thin ice, with a song on his lips. For the ski enthusiasts, Auli is an active destination. The Garhwal Mandal Vikas Nigam (GMVN) offers a fortnight-long skiing course for the amateurs. There is also a weeklong course for the tourists. The charges are Rs 3,500 per head; students may avail of a discount. The skiing equipment is also available at an affordable dent on your purse. But all the time and money is worth spending for one single downhill journey that is made on the skis. But ski slopes are not all. Nestled in the Garhwal Himalayas, Auli has many more highs. Look around, and there is a 180-degree view of snow-clad peaks - prominent being Nanda Devi, Chaukhamba, and Panch Chuli. The splurge of white is half-surrounded on one side by oak forests. Besides, the frequent thrashing that the slopes receive from imported snow beaters, make them a sight for sore eyes. The visitors can sit for hours on end, relaxing in God's own resort. All the basic necessities are at hand, sans the phone beeps. But most visitors find the absence of phone connections here a welcome change from other destinations. There is nothing in their world that cannot wait for 24 hours. But this is not to undermine the utility of scientific devices at Auli. 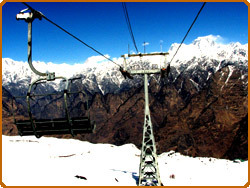 The upper slopes of Auli host the longest ropeway in Asia. This ropeway has ten towers of self-supporting steel structures, complete with saddles and shoes. Besides, Auli also offers the luxury of an 800-meter chair lift linking the lower slopes with the upper region. Remote-controlled hydraulic and pneumatic braking system makes it safe to travel in this chair, which also has a storm-warning device attached to it. Another comfortable scientific contribution to this highland is a state-of-the-art ski lift. For those heading for Auli, the best possible way is to catch the Dehradun Shatabdi Express to reach Rishikesh early in the morning. One must reach Joshimath, some 250 km from Rishikesh on the Badrinath route, before the sunset. Things start taking shape for the Auli visitors in Kaudiyala, some 200 km before the destination, on the Badrinath route. If you happen to stop at one of the many GMVN rest houses for a quick bite, the rear window of your vehicle may earn an “Auli” sticker as a souvenir. En route, one comes across confluences (called prayags) of various tributaries into the river Ganga. Infact, it is at Deoprayag where Bhagirathi and Alaknanda merge to be named the Ganga. Brief stopovers to these prayags - Deoprayaga, Rudraprayaga, Karnapryaga, and Nandprayaga - are an absolute must. 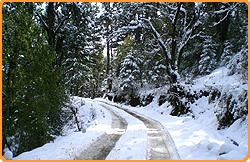 The scenic views of the Alaknanda valley, through out the uphill road are only aperitifs. The culmination point waits you at Auli. 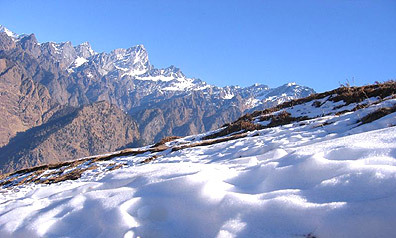 Auli is 16 kilometer from Joshimath. The chair-lift is the best way to move up the slopes, though you can spot the brave taking to trekking, often going knee deep on the virgin snow. As you may realize, the journey upward was merely a building up of the final thrill. And the coming down to find your feet, is a tribute to the heavenly forces that carve such spots on earth. Nearest railhead is Raiwala near Rishikesh (250 km approx); from here one can take a bus/tourist cars early morning to reach Joshimath/Auli by evening. Nearest airport is Dehradun (300 km approx). It is advisable to reach Joshimath by 4 pm, from where the ropeway chair can take you to Auli. Road to Auli is closed after dusk. 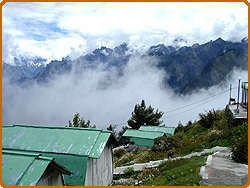 At Auli, The Royal Village is waiting for you to have a comfortable and royal stay.